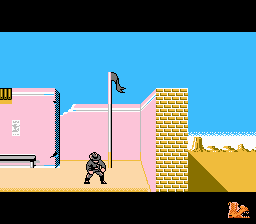 Play North & South online with Nintendo NES browser emulation for free! 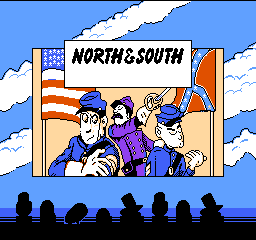 North & South (NES) game rom is loaded with features in our flash, java and rgr plugin emulators. Nothing to configure, we've done it for you! 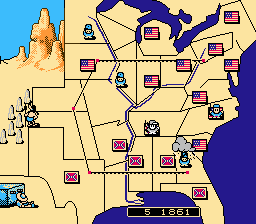 Based on the Belgian comic book, "Les Tuniques Bleues", this strategy game allows you to replay the American Civil War from both the North and the South sides.In the strategy part of the game, you can move your troops on a map of the US. 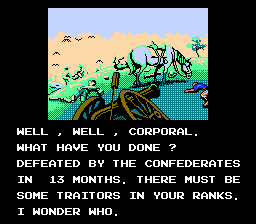 If two opposing armies enter the same state, the battle is played out in an action sequence. 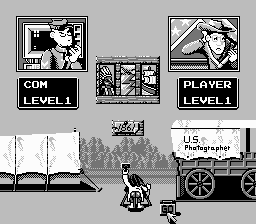 Additional action sequences must be accomplished when capturing an enemy fort or train.The game also offers a two-player-mode. Interesting concept. However, it ends way too soon. 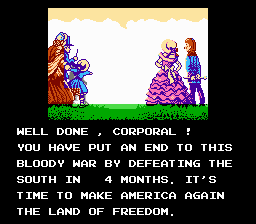 If this is "War" i don't see how it could ever last more than a year. 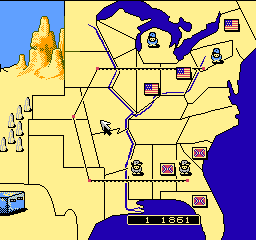 uhh, how do i get it going once im looking at the map?